Our mission is to conserve, maintain, and restore the Victoria Mansion property and collections to the highest standards, and to interpret them in their social and historical context to a local, state, and national audience. Also known as the Morse-Libby House, Victoria Mansion was built between 1858 and 1860 as a summer home for two people, Ruggles Sylvester Morse and his wife Olive. They were both from Maine originally, but Morse made his fortune in New Orleans where he operated luxury hotels. This spectacular summer home was designed by the architect Henry Austin of New Haven, CT and is widely considered one of the finest examples of the Italian Villa style in America. Strategically located near the city’s earliest gas and sewer lines, the house was a model of elegance and convenience with hot and cold running water, flush toilets, central heating, gas lights, a servant call-bell system, wall to wall carpeting, and a 25 foot long stained glass skylight. Morse hired Gustave Herter, a German-trained cabinetmaker and interior designer to decorate his summer retreat. Herter was one of the most influential designers in the United States during the second half of the nineteenth century. 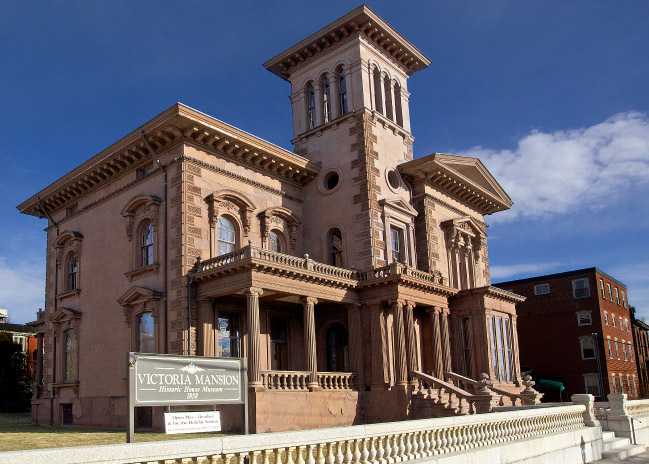 Today, Victoria Mansion is the only Herter commission that survives intact. Richly gilded surfaces, intricate plasterwork, enormous mirrors, and sumptuous fabrics combined to create lavish spaces of a palatial scale. Morse died in 1893 and the following year his widow, Olive Ring Merrill Morse, sold the house with most of its furnishings to J. R. Libby, a prominent dry goods merchant. The Libby family preserved the original décor and made few changes to the property. The Libbys occupied the Mansion until about 1929. In 1940 the house was rescued from an uncertain fate and has been open to the public as a museum since in 1941. 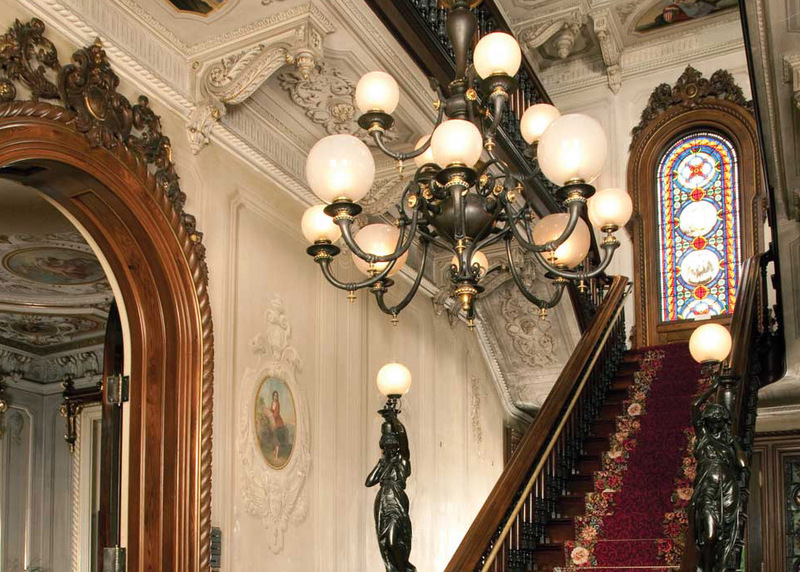 Today Victoria Mansion contains over 90% of the original interiors including almost all of the original wall paintings by the Italian-born artist Giuseppe Guidicini, a master of the trompe l’oeil (“fool the eye”) style; many surfaces in the house appear to be three-dimensional and warrant a second look. As an institution, Victoria Mansion strives to return the house to its original 1860 condition while preserving important evidence of its evolution over time. Thanks to an inventory of the house’s contents from 1893 and numerous historic photographs, it is possible to know with certainty where exactly in the house many objects were placed. As with any old house, deterioration happens, but careful monitoring and maintenance help to ensure that the Mansion remains stable and can remain open to visitors. Ongoing efforts to clean and restore paint, woodwork, furniture, and brownstone, combined with the replication of original textiles, allow visitors to see the Mansion in all of its nineteenth century splendor.